The map below shows the location of the plant in Pemalang, Batan, Central Java, Indonesia. In October 2011 two Japanese companies (utility J-POWER and Itochu, a conglomerate with major coal interests) teamed up with Indonesia-based Adaro Power (a subsidiary of Adaro Energy) to build a large coal-fired power plant using advanced ultra-supercritical technology. The three companies formed PT Bhimasena Power Indonesia to operate the plant, with power being sold to PT Perusahaan Listrik Negara (PT PLN), Indonesia's state-owned utility. Originally, the plan was for the first 1,000 MW unit to begin operating in late 2016, followed by the second 1,000 MW unit in 2017. If built, it will be the largest coal plant in Indonesia. The project was initially planned for commissioning by 2016, but has faced opposition from landowners and environmental groups, and delays in acquiring land and completing environmental assessments. To override local opposition, the government invoked the 2012 Land Acquisition Law, which enables land procurement in the name of the public interest. In April 2015 the government said it would start the construction on the plant at the end of the month, despite protests by local people. Unit 1 is now planned for commissioning in 2018, and Unit 2 in 2019. On April 30, 2015, Masayoshi Kitamura, president of J-Power, said, "We will start construction as soon as possible, at least by Oct. 6." On August 28, 2015, President Joko Widodo performed a ground-breaking ceremony at the plant site. Activists denounced the ceremony as a publicity stunt, pointing out that in reality landowners continued to refuse to sell about 10 percent of the 226 hectares needed by the project. In late September 2015 J-Power said it would miss the Oct. 6 deadline to provide initial funding for the plant due to long-running land disputes. In February 2016 the Supreme Court rejected a challenge by residents against lower court approval of the siting of the plant in central Java. The community is considering other legal options. The first unit is now planned for 2020. In March 2016 it was reported the plant was beginning the construction phase. In June 2016 JBIC approved a US$3.4 billion loan agreement for the plant. In March 2018 PT Bhimasena stated that construction was 40% complete. The World Bank's Indonesia Infrastructure Guarantee Fund (IIGF) awarded its first government guarantee of US$33.9 million to the project. The bank also served as the transaction advisor for the project, arranging financing and promoting the project to investors. All of the World Bank Group’s activities surrounding the Central Java Power Project add up to as much or more involvement than is typically expended for a direct project investment by the World Bank Group. However, because the World Bank Group has approached this project through back door means, i.e., financial intermediaries and off-budget grants for technical assistance, this mega coal project did not have to meet the World Bank Group’s criteria for coal lending, including full consideration of alternatives, internalizing the cost of carbon, and optimizing energy efficiency and conservation measures. Such an approach has also resulted in less international scrutiny and transparency than is typically involved in Bank-supported coal developments. In August 2014 it was reported that the Japanese Bank for International Cooperation (JBIC) was considering funding 60% (over 400 billion yen) of the plant’s construction, using public funds. In June 2016 JBIC approved a US$3.4 billion loan agreement for the 2,000 MW project, joined by a string of commercial banks: Japanese banks Sumitomo Mitsui Banking Corporation, Bank of Tokyo-Mitsubishi UFJ, Mizuho Bank, Sumitomo Mitsui Trust Bank, Mitsubishi UFJ Trust and Banking Corporation, Shinsei Bank and Norinchukin Bank, and two Singapore based banks, DBS Bank and Oversea-Chinese Banking Corporation. According to Greenpeace Indonesia, the planned site for the plant is in the Ujungnegoro-Roban coastal area, which is a marine conservation area and was declared an area for development of marine tourism under Government Regulation No. 26/2008. The plant will infringe upon a protected area, in direct contravention of Central Java provincial bylaw No 6/2010 on spatial planning. If construction of this coal plant goes ahead at least five villages in the Batang area will be demolished, and hundreds of hectares of jasmine, plantations and paddy fields will be destroyed. Arif Fiyanto of Greenpeace Indonesia said, “The planned coal plant will pollute rich coastal fishing waters and threaten the livelihoods of more than 10,000 small-scale fishermen.” Greenpeace also reported that the plant will emit 226 kg of mercury per year. Around 7,000 residents of the five villages affected by the project are strongly opposed to its construction. In addition, a range of environmental and human rights groups have protested the project. About 74 farmers from four villages in Central Java’s Batang regency have refused to sell their land for the project. In December 2015, the National Human Rights Commission, an Indonesian state-sanctioned but independent group, sent letters to Prime Minister Abe and the Japanese parliament requesting that greater attention be paid to human rights issues associated with the plant. The letter stated that since 2013, a pressure campaign had been conducted against hold-out landowners “including intimidations and physical and mental threats.” According to additional comments by commissioner Dianto Bachriadi, heavy machines driven by military soldiers hired by the government and the consortium made canals surrounding the properties of local people who were refusing to sell. “It has made them isolated. People from outside can’t go in and the residents can’t bring their products out,” he said. According to Bachriadi, the commission had previously recommended that the project site be moved to a less-populated and less-conflicted area, but the recommendation was ignored. In July 2015, three villagers affected by the proposed plant traveled to Tokyo to personally deliver an official objection to the Japan Bank for International Cooperation (JBIC), the public financial institution considering funding the project. The objection filed with JBIC was signed by 23 leaders of the local community organization known as Paguyuban UKPWR. The communities also filed a complaint against Japanese companies Itochu and J-Power under the OECD Guidelines for Multinational Enterprises. The communities allege that JBIC has violated its social and environmental guidelines in proceeding with the project. On July 22, 2013, about 150 people protested against the project in front of the Japanese Embassy in Jakarta. The protesters were members of Paguyuban Rakyat Batang Berjuang Untuk Konservasi, supported by Yayasan Lembaga Bantuan Hukum Indonesia (YLBHI), or Indonesia Legal Aid Foundation (YLBHI). According to protesters, the project would heavily impact the livelihoods of thousands of fishermen due to its effects on coral reefs and other environmentally sensitive areas. In addition, the 200-500 acres used by the project would destroy irrigated rice fields and tens of thousands of trees. Among the protesters was M. Ali Tafrihan of Roban village, who reported being jailed for six months as a result of his opposition to the project. According to Lembaga Bantuan Hukum (LBH) Semarang, a legal aid organization that has been working with residents at the project site, thugs as well as police and members of the military have used intimidation tactics against those who have refused to sell their land. In July 2013 Bloomberg reported that the plant was delayed due to difficulties acquiring land, environmental assessments, and local opposition. As a result of the problems, the onset of construction was reportedly postposed by two years, from October 2012 to October 2014. According to a spokesman for J-POWER, 80 percent of land needed for the project had been acquired. Residents speak out against Central Java Project, November 25, 2013. Courtesy of GreenpeaceIndonesia. In October 2013, a decree by President Susilo Bambang Yudhoyono revised a regulation that required the project one year after signing its contract to secure financial backing. Following the extension, the Jakarta Post reported that the consortium sponsoring the project and the government "are working on a persuasive approach to win the hearts of local residents." Garibaldi Thohir, president of Adaro Energy, said, "The important thing now is how to approach the community. I myself, along with Pak Ganjar will take part in the socialization program." Ganjar Pranowo is the governor of Centra Java. 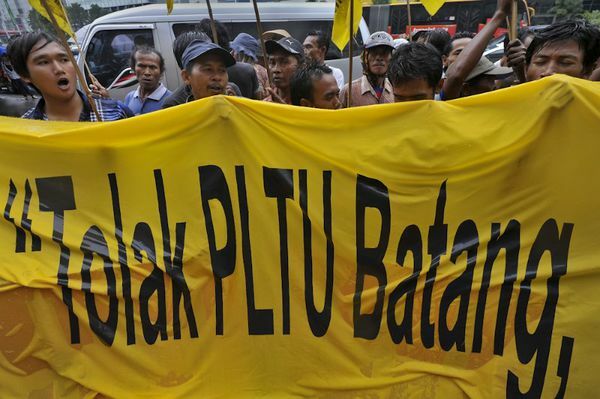 In June 2014 PT Adaro said Bhimasena Power Indonesia (BPI), the project's joint venture between Japan's J-Power, Itochu, and Adaro subsidiary Adaro Power, declared force majeure with suppliers and Indonesia state-owned electricity company PLN on June 27, 2014, due to delays in acquiring the necessary land. Force majeure is a legal clause that allows companies to walk away from contracts soured by external events. BPI is committed to continue the project, the statement said. Originally the project was estimated to cost US$3.2 billion. In October 2013, Boy Garibaldi Thohir, president director of Adaro Energy, said that the cost of the project had risen significantly. Boy declined to state an exact figure but said that the total was not more than $5 billion. The cost increases have delayed the financial closing of the project. In 2015 the cost was estimated at US$4 billion. The project will use ultra-supercritical technology, which offers combustion efficiency of 43 percent. The relative reduction in carbon dioxide emissions provided by the high efficiency of the combustion technology has been cited by Japan's prime minister Shinzo Abe, among others, as an argument for constructing the plant. According to the Nikkei Asian Review, promoting of ultra-supercritical technology as a climate change solution is linked to Japanese government efforts to assist Japanese businesses against Chinese rivals for coveted overseas power plant construction contracts. "We want to make the Central Java project a showcase that will open the door to more projects," said an official at Japan's Ministry of Economy, Trade, and Industry. October 2013 - companies announce that construction would be delayed at least two years due to environmental assessments, local opposition, and difficulties acquiring land. April 2014 - Coordinating Economic Minister Hatta Rajasa says 29 ha of land are still in question from the 226 ha needed for the megaproject. June 2014 - Bhimasena Power Indonesia declares force majeure, a legal clause that allows companies to walk away from contracts soured by external events. 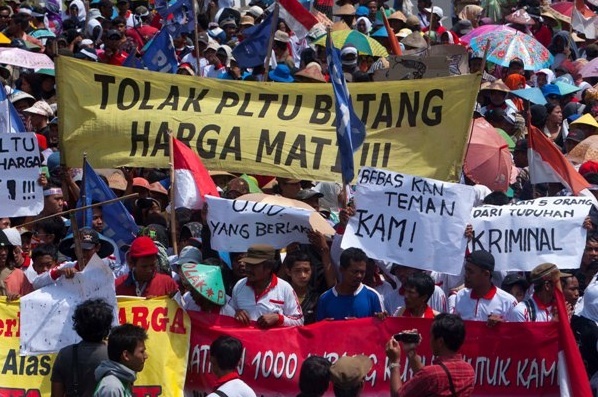 Mar 2015 - Batang residents and Greenpeace Indonesia activists protest a statement made by President Jokowi in which he claimed that obstacles hampering the construction of the plant had been overcome. Aug. 28, 2015 - Jokowi officiates the ground-breaking ceremony for the project, although 11.1 ha of land still needed. September 2018 - Construction described as 50 percent complete, with a target date of 2020 for commissioning. December 2018 - Construction described as 63 percent complete. ↑ 2.0 2.1 2.2 2.3 "Adaro venture backs out of Central Java power project," Nikei Asian Review, July 8, 2014. ↑ "Standing up against Japan’s coal-fired power plant export: Locals affected by the Batang coal-fired power plant project speak out," No Coal, Go Green, August 19, 2014. This page was last edited on 12 December 2018, at 16:44.